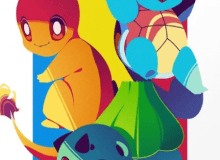 What Kanto starter Pokemon are you??? Hey guys! Dovewingfan again! I'm back with a new quiz; one that's different from all the others! It's a (drumroll plz) ..... Pokemon quiz! It's my first ever one!!! Dovewingfan: ok, the first question is what weather do you prefer? Dovewingfan: ok, please welcome my first Pokemon. From the Kalos region, he was my first Pokemon, and therefore my starter! Give it up for.... Fenn the Delphox!! !Fenn: hey everyone! I'm Fenn, and I'm here to ask you a question. What do you expect in a freind?Dovewingfan: ooh nice question. Freinds.....? What are those....? I just have fans. Fenn: welp, bai everyone! Dovewingfan: ok, welcome my second pokemon... Fletch the Talonflame!! !Fletch: hey!!! My question is... What do you think of Pokemon? OMG ARE YOU KIDDING??? I LOVE POKEMON!!! Fletch: welp see ya! !Dovewingfan: ok for the fourth question we have Rala the Gardivoir!! !Rala: ok what is your favorite color?Dovewingfan: um aren't you supposed to be the smart one?? ?Rala: shut up or i will release a black hole on you all. Rala: bye yall *uses teleport*Dovewingfan: *sigh* ok next up is my Florges, Flora!Flora: hi dere :3 !!! My question is where would you like to live? Dovewingfan: Flora you have to go nowFlora: awww do I has to???? D:Dovewingfan: yes. I know you're clingy and all, but it's someone else's turn to ask a question.Flora: awww byeDovewingfan: and next up we have Bulba the VenasuarBulba: hello! Ok, so what do you like to do in your spare time??? Quiz topic: What Kanto starter Pokemon am I?? ?